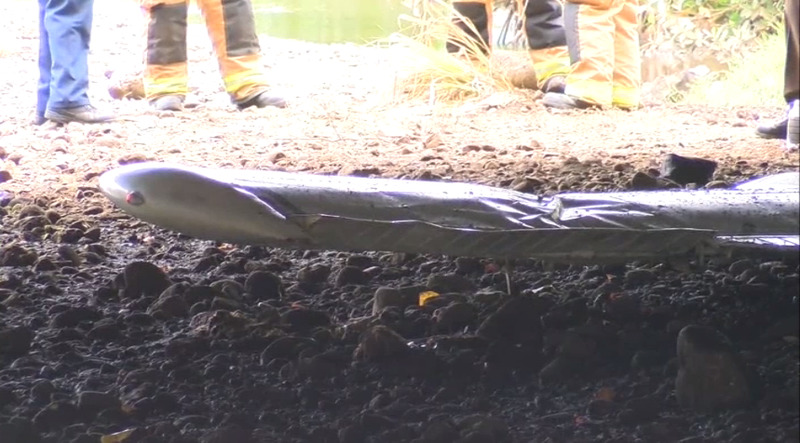 On June 30, 2017, about 1330 Hawaii-Aleutian standard time, a Piper PA-28-140 airplane, N4244T, collided with the ground under a highway overpass following a loss of engine power shortly after takeoff from Daniel K Inouye International Airport (HNL), Honolulu, Hawaii. 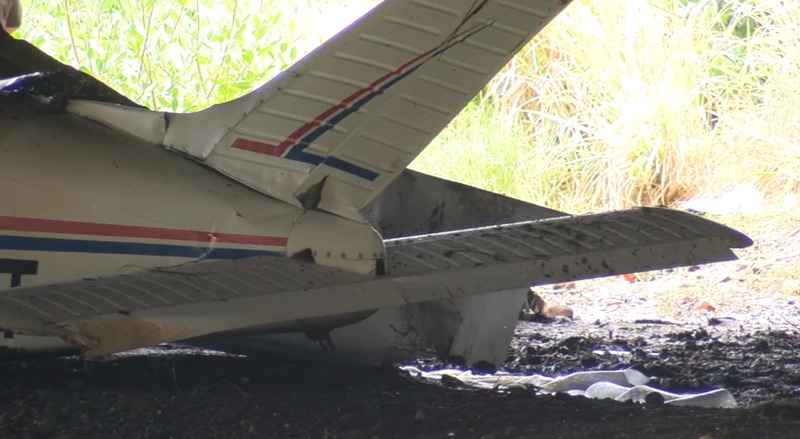 The private pilot, a commercial pilot rated passenger and a passenger were seriously injured. The airplane was substantially damaged. The airplane was privately owned and operated under the provisions of Title 14 Code of Federal Regulations Part 91. Visual meteorological conditions prevailed, and no flight plan was filed for the local personal flight that departed HNL at 1320. 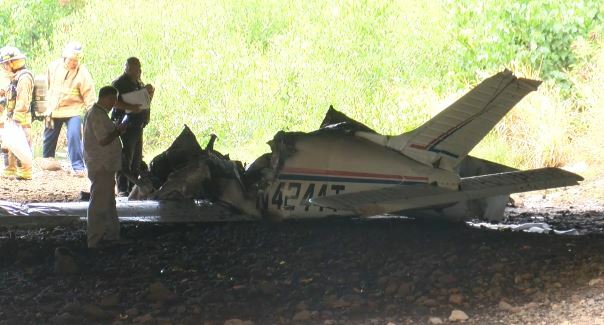 The pilot reported that a preflight inspection was accomplished and that a minimum of 20 gallons of fuel was on board. The engine was started, and the airplane was taxied to an open area for a run-up. Shortly after takeoff from runway 4 left, about 300 ft above ground level, the pilot noted that the engine lost power. 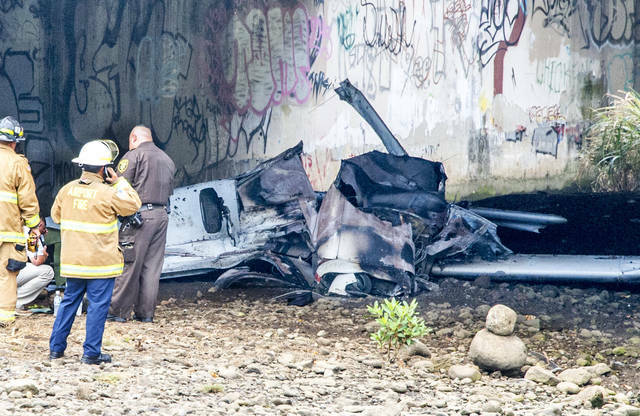 He subsequently initiated an emergency landing to a riverbed; the airplane came to rest under a highway overpass and caught fire. 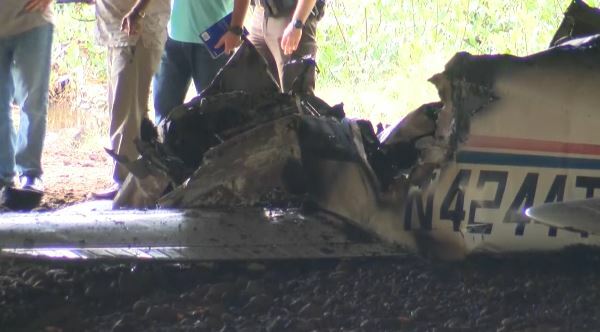 The rear seat passenger reported to a Federal Aviation Administration (FAA) Inspector that the right seat pilot took control of the airplane just prior to the collision and he had cut off the mixture (and power) just prior to ground impact. The owner of the airplane reported that the airplane had been flown every day and no issues with the operation of the airplane were reported. He indicated that the fuel tanks would be filled to the tabs (20 gallons in each tank). The airplane would fly one flight with the fuel selector positioned to one fuel tank, and then on the next flight it would be positioned on the other fuel tank. Prior to the accident flight, the owner had instructed the pilots to switch fuel tanks prior to takeoff since they were used to flying in Cessna airplanes that flew with the fuel selector positioned to BOTH. The 20-year-old left seat pilot held a private pilot certificate with a rating in airplane single-engine land. The pilot held a Federal Aviation Administration third-class medical certificate issued February 3, 2017 with no waivers or limitations. The pilot's total flight experience was about 68 hours. He logged 28 hours in the previous 90 days, and 8 hours in the previous 30 days. A total of 5 hours were logged in the make and model airplane involved in the accident. The 28-year-old right seat pilot held a commercial certificate with ratings in airplane single-engine land and instrument airplane. The pilot held a Federal Aviation Administration first-class medical certificate issued October 4, 2015, with no waivers or limitations. The pilot's total flight experience was about 775 hours. The 4-seat, low-wing, fixed-gear airplane, serial number 28-7225103, was manufactured in 1971 and was powered by a 140-horsepower Lycoming O-320 series engine. The owner of the airplane reported that the maintenance logbooks for both the airframe and engine were inside the airplane at the time of the accident and were destroyed in the post-crash fire. No total times nor maintenance inspection documentation was obtained. The airplane came to rest under an overpass about 1.5 miles north of the departure end of runway 4 left. The ground was dirt and loose rocks. The first of 3 ground impact points was noted about 55 ft south of the main wreckage. The main wreckage was facing to the south and laying on its belly. 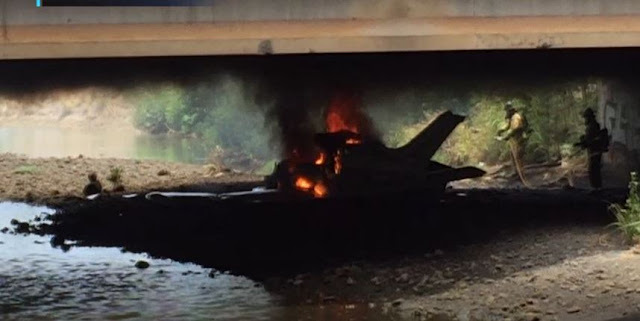 The landing gear had separated and was in front of the engine, which remained partially attached at the firewall. The inboard section of the right wing remained partially attached at the fuselage. The outboard wingtip section was separated and within about 13 ft of the wreckage. The left wing, in its entirety, remained attached to the fuselage, however was deformed about mid-section. The empennage remained in place. All flight control surfaces were accounted for. The aft end of the engine and cabin area, aft to the baggage compartment, was consumed by the postimpact fire. The postaccident engine examination revealed that the engine sustained fire damage primarily to the rear engine compartment. The cockpit controls were destroyed and could not be moved or identified. A visual examination of the engine revealed no evidence of a catastrophic engine failure. The top and bottom spark plugs were removed and noted that the electrodes displayed normal operating signatures. The magnetos remained in place to their mountings, however were destroyed by heat distress and could not be tested. The engine valve covers were removed and the crankshaft was turned by hand. Thumb compression was established in each cylinder. Accessory gear and valve train continuity was established. The oil filter/screen was destroyed. The carburetor was destroyed by fire. The fuel selector valve was burned and melted. The valve position could not be verified. On June 30, 2017, about 1330 Hawaii standard time, a Piper PA-28-140, N4244T, sustained substantial damage following a loss of engine power and subsequent hard landing near Honolulu, Hawaii. The private pilot and two passengers sustained serious injuries. The pilot was operating the airplane under the provisions of 14 Code of Federal Regulations (CFR) Part 91. The local personal flight departed Honolulu International Airport at 1320. Visual meteorological conditions prevailed, and no flight plan had been filed. The pilot reported that shortly after takeoff from runway 04L, the engine lost power about 300 feet agl. He made an emergency landing at the nearest clear area, which was a river bed. 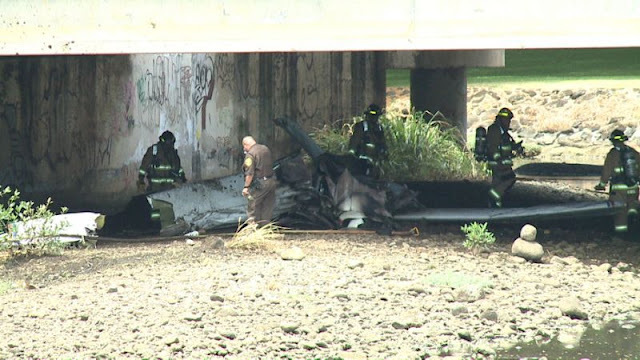 The airplane impacted the ground and came to rest under a highway bridge and caught fire.